San Fabian-30 January. 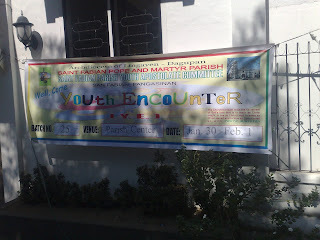 The Parish of St. Fabian, Pope and Martyr, today holds a "Youth Encounter". The YOUTH ENCOUNTER serves as the basic formation program for the youth in the Archdiocese. The YE as it is popularly called started in Virac, Cantanduanes in 1971. 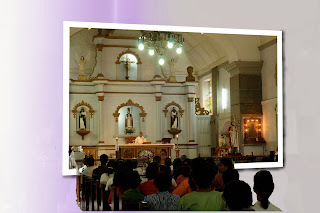 Since then, it has spread to countless schools, parishes and dioceses all over the Philippines. The first Youth Encounter in the parish was held in15-17 August 2003. the parish has held several Youth Encounters since then. In its vision of a revitalized and extensive evangelization of the parish, the Parish Youth Apostolate Committee will be offering the Youth Encounter program to the different barangays of the parish. Hopefully, the first of these YEs will be held by March 2009. A new Parish Youth Apostolate Committee officers were appointed by the Parish Priest, Fr. Oliver E. Mendoza, to respond more fruitfully to the challenges of the evangelization program of the Parish. This YE is from 30 January to 1 February, the first for the year 2009. The first Youth Encounter of the Parish held last 15-17 August 2003 was facilitated by the Archdiocesan Youth Apostolate staff. This batch has become the nucleus of the present PYAC and they have been giving YEs to the youth of the parish as well as to the Vicariate of our Lady of the Most Holy Rosary. San Fabian- 29 January. 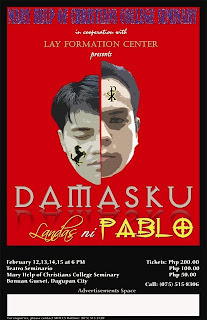 To celebrate the year of St. Paul, the Mary Help of Christians College Seminary, Bonuan Gueset, Dagupan City is holding a play entitled: "Damasku: Landas ni Pablo". The play is about the turning point in the life of St. Paul as he was going on to Damascus to arrest and persecute the followers of Jesus. The play is written, directed and acted by the seminarians. Proceeds of the play will be used to repair the twenty year old seminary building. The seminary is under the Rectorship of Rev. Fr. Mario R. Morales. The following are the rest of the administration: Rev. Fr. Jim Cerezo, the Dean of Seminarians, Rev. Fr. Mario Sanchez, the Dean of Studies, Rev. Fr. Julius Cuison, the Spiritual Director and Rev. Fr. Roberto Villamil, the House Minister. The parishioners of San Fabian are urged to watch the play and support the College Seminary of the Archdiocese of Lingayen-Dagupan. Play dates are on 12, 13, 14, 15 February. Tickets are sold at P200.00, P100.00 and P50.00. Tickets are available at the Parish Office. (Tel. No. 6375 522 4855). For further information, kinldy contact the seminary: +63 75 515 5720. San Fabian - 25 January 2009. 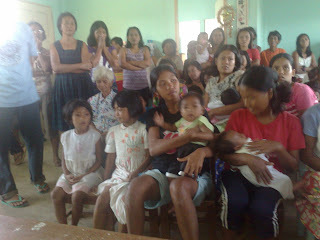 Sixty families from Brgy. Longos Parac-parac received a package each containing three kilos of rice, some noodles and other household items good for a few days consumption. The packages were collected from the donations given by the parishioners last month during the Christmas season as part of a Social Action program of the parish. These were distributed after the Barangay Mass. Fr. Oliver E. Mendoza, the Parish Priest, celebrated the mass. He reminded them of the dictum "God helps those who help themselves" especially in these difficult times. Bro. 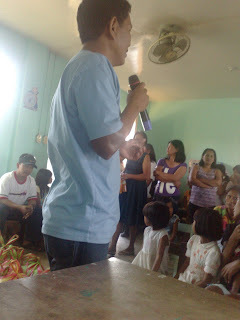 Tony Supremido, the Parish BEC Coordinator and the Parish Social Action coordinator, spoke to the families. He told them that the package will only last for a day or two. He urged them to work instead and not to always rely on what other people will give them. "Even planting vegetables in a small plot at the back of your house will surely help you in these hard times," he further said. Bro. Norvel Soriano, the Barangay coordinator, reiterated what Bro. Tony told the group. He added that "we should not always be at the receiving end." He hopes that "the barangay residents will also help and give to others." On behalf of his co-barangays, he thanked the generous donors of the parish who gave so much for them. Bro. Norvel Soriano, the coordinator, giving a talk to the residents. 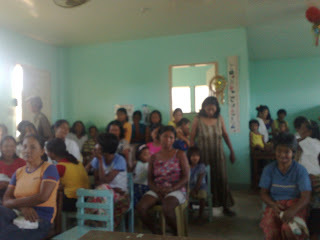 The residents of Barangay Longos Parac-parac at the Day Care Center. San Fabian - 20 January. A procession in honor of St. Fabian, Pope and Martyr, started the day's fiesta celebration of the patron saint of the parish and of the town. After the 6 o'clock AM mass, the parishioners gathered at the Church patio for the procession. The different barangays participated in the procession. They brought along with them the images of their patron saint which were all decorated with flowers and put on beautiful carriages, while others were put on tricycles but still beautifully decorated for the procession. The procession was led by the members of the Ministry of Altar Servers. The Archdiocesan School of San Fabian Drum and Lyre Band provided the band music accompanying the parishioners during the procession. The procession passed through Block 4, Sagud Bahley, before turning left to the main highway and finally entering at the main gate of the patio of the Parish Church. The members of the Knights of Columbus accompanied the statue of St. Fabian during the procession. Msgr. Rafael S. Magno, Jr, Vicar General and former parish priest of San Fabian presided over the mass at 8 o'clock AM. The native priest-sons of San Fabian concebrated in the mass. They were: Rev. Fr. Abraham Equig, Rev. Fr. Francisco Ungria, Jr. and Rev. Fr. Alfred Viernes. Rev. Fr. Oliver E. Mendoza, the parish priest, joined them in the mass. Fr. Frank Ungria, Jr. is incardinated in the Archdiocese of Manila and is presently the parish priest of St. John the Baptist Parish, San Juan, MM. He is the son of Atty. and Mrs. Francisco Ungria, Jr. Fr. Alfred Viernes is incardinated in the Diocese of Alaminos. He is presently the parish priest of Sto. 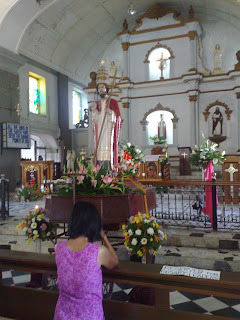 Nino Parish, Mabini, Pangasinan. Fr. Alfred is the son of Mr. and Mrs. Ildefonso Viernes. Fr. 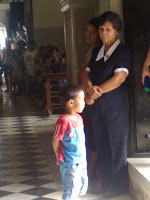 Abe Esquig is now retired in the active ministry but he is still helping in the parish of St. Fabian. He celebrates regularly the 8 o'clock AM mass every Sunday. He now lives in Brgy. Bolasi. Msgr. Rafael S. Magno, Jr. in his homily spoke about the value and meaning of peace. He reminded the parishioners about the story of the dove perching on St. Fabian which became the acknowledged sign that he was chosen by the Holy Spirit to become the next pope after Pope Anterus died. The dove is a symbol of peace. Msgr. Magno encouraged everybody to work for peace. Rev. Fr. Joel F. Ynzon, the Vicar Forane, administered the Sacrament of Confirmation after the mass. To see more fiesta pictures, please click here. 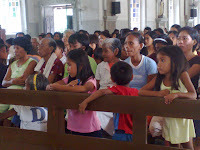 Parishioners attending a Sunday regular mass celebrated by Rev. Fr. Abraham Esquig, a native son of San Fabian. 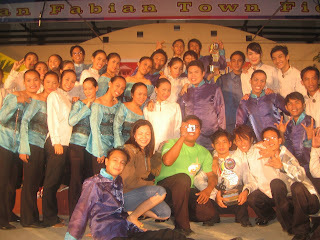 San Fabian - 19 January 2009. 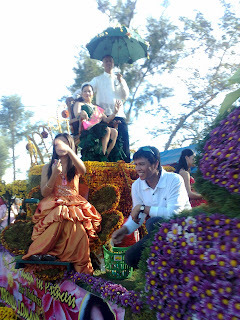 On the eve of the fiesta of San Fabian, a morning parade featuring the 2009 Miss and Mrs. San Fabian Queens and Princesses was held. They rode on individual floats with their Prince consorts. The 2009 Miss San Fabian is Ms. Michaela Andrada Albay, a 17 year old daughter of Mr. and Mr. Michael Albay. The 2009 Mrs. San Fabian is Mrs. Angelita de Vera Sison who is presently residing in Ontario, Canada. She is married to Mr. Robert Zarate Sison. The other 2009 Queens and Princesses are: Mrs. Virginia Lomandas Gacula (Mrs. San Fabian 1st Princess), Mrs. Alejandra Narvas Priest (Mrs. San Fabian 2nd Princess), Miss Floriliza Jane Abaoag (Miss San Fabian 1st Princess), Miss Aileen Halog Disu (Miss San Fabian 2nd Princess). The parade was participated in by the different government agencies, NGOs, Academe and local organizations. To see more of the Town's Fiesta parade pictures, please click here. 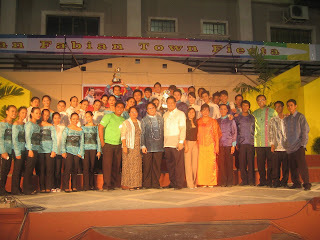 One of the four parish choirs, Handog, won in the 2nd Choral Competition sponsored by the local government of San Fabian as part of the celebration of the Fiesta of San Fabian. 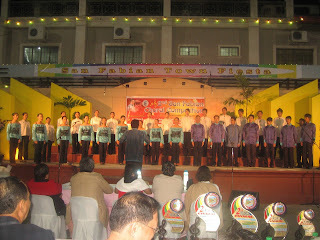 The singing contest was open to all public and private schools and choirs of the town. The contest was held last 16 January 2009. It was held at the San Fabian Public Auditorium. Handog, a contraction of "Hand of God", has for its members young people who also are members of the Parish Youth Apostolate Committee, the youth organization of the parish. They have been singing in the Sunday afternoon mass for several years. The Sunday 4,30PM mass is also the youth mass of the parish. Handog is led and trained by Bro. Xavier Narvas. Right now there are two Handog choirs. They won first place in the free piece category by singing the piece "Hawak Kamay" and second place in the "Kansyon na San Fabian" piece category. The members of the "HANDOG". Soprano: Agnes Abrigo, Hazel Apellido, Jiesel Lobo, Katherine Quinto, Katrina Narvas, Katrina Petilla, Lelet Gatchalian. Alto: Divina Biason, Girlie Hortaleza, Guenever Winona Marmolejo, Jacquelyn Roces, Ma. Josah Orpilla, Liezl Bucao, Lyra Mae Nabua, Odessa Cerezo, Racy Raguindin, Valerie Bautista. Tenor: Alejo Gabriel, Arjay Gali, John Paul Catalan, Joseph Calicdan, Pedel Pedral, Rodrigo Puzon, Ryan Gonzalo. Bass: Arnel Caguya, Felipe Basilio Ramos, Jayfer Balecha, Jordan Nabua, Mach Junemel Vidal, Noel Ganacias, Ronel Clores, Ryan Galacha, Samuel Narvarte. Accompanist: Frederick Narvas. The novena to St. Fabian, Pope and Martyr, started last January 11. The nine day prayer will end on the 19th of January, the eve of the feast of the patron saint of the parish and the town. A novena is a nine-day period of private or public prayer to obtain special graces, to implore special favors to make special petitions. Novena is derived from the Latin word "novem" meanaing "nine". The novena is prayed every afternoon at 4:30. A mass immediately follows after the novena prayers. The different parish religious organizations and movements are in-charge of the novena. Each day a different parish organization leads the recitation and the praying of the novena in honor of St. Fabian. 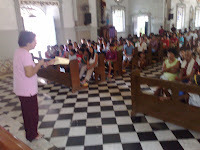 The different BEC barangay communities actively take part in the novena. The novena prayer in Pangasinan was composed by Rev. Fr. Abraham Esquig, a native son of San Fabian and a former parish priest (1981-1987). The 34th Parish Renewal Experience (PREX) weekend seminar was held in the Parish of St. Fabian, Pope and Martyr, last 9-11 January 2008, Friday to Sunday. It was sponsored by the PREX Class 33 which had their weekend seminar last November of last year. PREX Class 34 is the first weekend seminar held in the parish for the year 2009. Fr. Oliver E. Mendoza, the parish priest facillitated the talks and conferences. He was ably supported by Sis. Ma. Rowena A. Nicer, the Parish PREX coordinator and Sis. Shirley Tersol, a member of the PREX secretariat, who gave one talk each. Since it was first held in the parish in 2004, the PREX graduates have become more active and more supportive in the parish life and ministry, serving in the various apostolates as Lectors and Commentators, Eucharistic Ministers, Catechists, Youth animators. They have also become active new members of the different religious organizations of the parish. The PREX weekend seminar is an adult formation program of the parish. It has produced more than a thousand graduates so far. In a circular letter signed by Msgr. Renato P. Mayugba, DD, the Auxiliary Bishop, an invitation coming from the Biblical Apostolate of the Archdiocese together with the Family and Life Apostolate addressed to the different Bible animators, Family Life workers, Catechists, BEC Coordinators and Youth, and various religious organizations and movements (CFC, WE, ME, CFM and other such groups) of the different parishes and chaplaincies of the Archdiocese to celebrate the First Family Bible Congress. The congress is to be held on January 17, 2008, Saturday. It will start on 1:00 PM and will end at around 5:00 PM. The St. Therese Gym of the St. Therese Parish in Dagupan City will be the venue of the congress. Fr. Fidelis B. Layog, the Archdiocesan Biblical Apostolate Director, said that about 300 delegates are expected to attend the first Family Bible Congress. The congresss’ objectives and rationale are the following: to celebrate the centrality of the Word of God in the life of the Christian family and that the Word of God will be the bond of unity in the family. Msgr. Renato P. Mayugba DD will the main speaker of the event. The Parish of St. Fabian, Pope and Martyr, welcomes the celebration of the Family Congress as it will strengthen and consolidate its pastoral program in building small communities centered and founded on the Word of God. The Catholic Women's League of the Parish of St. Fabian, Pope and Martyr, once again shared Christmas joy to the less fortunate in the parish by holding their annual "Gift-Giving" program. About 600 indigent families were given a bag each containing rice, sardines and some noodles. The program was held in the afternoon of 31 December 2008. Mrs. Alicia Z. Gubatan, the President of the CWL of the San Fabian Chapter, led the organization, re-packing and distribution of the gifts. Generous donors of the parish provided the gifts which were distributed to the families concerned. 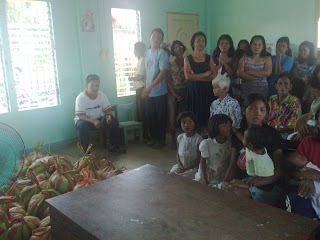 The CWL has been holding the gift-giving program for several years already. It has been one of the much awaited programs of the parish.